Most interviewers have the best intentions. They want candidates to feel at ease while still getting to know the person “beyond the resume.” And that is not just fine; it’s encouraged! The most effective interviews are the ones where both sides come away comfortable and feeling like they learned about each other. However, sometimes best intentions inadvertently slide into biased and discriminatory behavior. Here are a few common interview questions that you may not realize you should not be asking. Most interviews start with small talk and that’s totally cool. Small talk puts the candidates at ease and creates a comfortable transition into the actual interview. And, yes, you can only talk about the weather so much. But a seemingly innocuous question like “Did you grow up around here?” can actually introduce unintentional bias into the conversation. And not to mention, it’s illegal. You cannot base employment decisions on national origin. Asking where someone grew up opens the door for potential national origin discrimination. 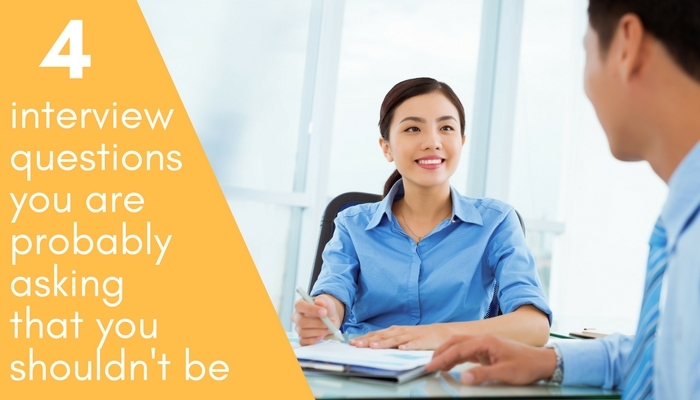 This is another innocent question that is a big “no-no.” Interviewers often ask about personal situations because it gives them something relatable to connect with the candidate. You have kids, I have kids, let’s chit-chat about T-ball. However, asking about children can lead to bias and discrimination. It is unlawful to deny someone employment if they have children or if they are planning on having children in the future. Similarly, asking if someone is married can inadvertently reveal sexual orientation. Marriage and children questions are particularly biased against female and LGBTQ candidates. What you can do: Just don’t ask about their spouse or kids. If they bring it up (and many will), bring it back to the context of the role they are interviewing. For example, if a parent mentions their PTA involvement, ask them how that activity has helped them lead teams and manage conflict which are applicable workplace skills. Interviewers usually ask this question with the best of intentions. They just want to understand the experience level of the candidate. But by answering this question, a candidate will accidentally reveal their age. And age discrimination is a real thing, particularly in youth-oriented industries such as tech. What you can do: It’s ok to ask how long they have worked in your particular industry. Just don’t ask them when they first started working, graduated from college and (especially!) when they were born. This question is often asked out of curiosity, especially of candidates with international educational or work experience. But the law says that employers do not have the right to know what a candidate’s first language is. What you can do: If the position requires candidates to be bilingual, you can ask which languages they are fluent. If the position does not, just do not ask. By all means, create connections with the candidate during the interview. This makes for a better experience for both of you. Just make sure the questions you ask to create those connections, don’t lead to unintentional bias, or worse, legal implications. Stick with universal small talk, and keep your follow-up questions applicable to the position, and you will create an unmatched interview experience for your candidate. This entry was posted in Talent acquisition stuff by carmenfontana. Bookmark the permalink.